Review: "Shaken: Stories for Japan"
Click here to get "Shaken: Stories for Japan" from Amazon for the K... Look for it soon everywhere else. I'd never heard of the Japan America Society of Southern California before picking up a copy of "Shaken: Stories for Japan." As of the anthology's publishing, the Society has been in existence for 102 years. Before the earthquake and subsequent tsunamis that hit Japan in March 2011, I hadn't heard of many of the places in Japan that would dominate world headlines. That's what a tragedy will do. For all the wrong reasons, it brings together people regardless of borders, cultures or routine. For all the right reasons, a group of authors decided to put together an anthology of short stories. Each contribution intertwined some component of Japan and its people, be it present or past. All the proceeds go toward the ongoing relief efforts in Japan following those few minutes that changed everything. Amazon even agreed to donate its portion. The win-win-win of this anthology is a sign of humanity in an otherwise inhuman event. That third win is for the reader. The quality of these stories is remarkable. I'm not saying other charitable anthologies aren't worth your time, but some forget about where these donations ultimately come from: the reader. The authors didn't submit backwash sitting idle on their desktop. No, these are quality stories that could stand on their own. It speaks to their passion for responding to this disaster that they would contribute such salable work. In addition, each story is partitioned by haiku from "Narrow Road" by Matsuo Basho, one of the most renowned names in the craft. It reminds the reader of the timelessness of Japan, and why a country so eternal will survive to see better days. It's a bit daunting to review each story individually, but I can say each was a treat to read. This is my first introduction to fiction with a Japan theme. It won't be my last, though, not with this talented roster. I'll be checking out their work. Aside from Japan, a recurring theme was justice. Some find it, some don't. In the wake of a tragedy that still seems so unjust, that theme speaks loud and clear. Nature is cruel. It knows no justice, because nothing can deny it. All you can do is plan for it. Which is what I encourage everyone to do with this anthology. 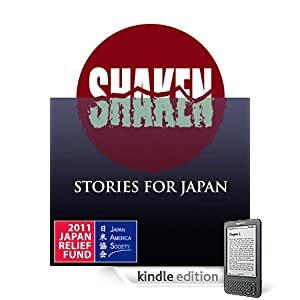 Click here to get "Shaken: Stories for Japan" from Amazon for the K.... Look for it soon everywhere else. Thank you, Ben. That was lovely! Some beautiful lines there. :) And I'm so glad you liked the book. Will send your blog to Tim.